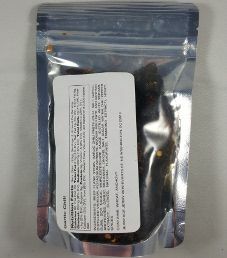 The first review for Jerkface will focus on a 2 ounce/56 gram bag of their Garlic Chili flavored beef jerky. This flavor is described as their most popular flavor, with medium heat, and delicious complexity. The jerky was kindly submitted for review by the owner, Eric Judycki. 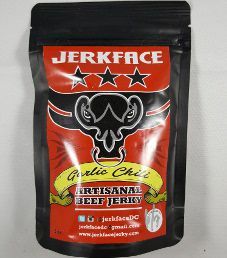 This Jerkface brand name is located in Washington, DC, and is distributed under the name of Jerkface Jerky. After Eric received his first dehydrator from his girlfriend, he exceeded her expectations. Eric continued to test out new flavors, using his friends as “flavor guinea pigs”. With Eric’s connections to the DC craft beer community, and active imagination, he decided to launch the Jerkface brand name in 2013. The Jerkface name is an homage to a close friend that passed away, whose favorite loving salutation was yelling “Jerkface!” whenever happily greeting a pal. Only high quality lean flank steak is used, known for its awesome texture. There are currently 8 flavors of jerky available. The flank steak used is not guaranteed to be free of growth hormones or additional antibiotics. Also, the beef is not guaranteed to have at least partial free range access to graze on grass. As a result, the highest ingredient rating that can be awarded is a Good (8/10) rating. 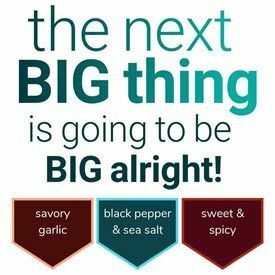 The liquid marinade is comprised of an average garlic chili paste, soy sauce, a high quality Worcestershire sauce, and healthy honey. Garlic itself is extremely healthy. Hot chili peppers are healthy also if eaten in moderation. The sugar level is respectable at 3 grams of sugar per 28 grams of jerky. The salt level is a little high at 380mg of salt per 28 grams of jerky. Our preference is 350mg of salt or less per 28 grams of jerky. In fairness, no added salt is used. This jerky does qualify to have no sodium nitrite, or any other similar unhealthy preservatives. Instead, the main preservative used is salt. Admirably, there is no MSG added. 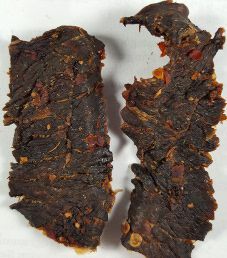 These strips of jerky are mostly medium in size, and are sliced thick. The flank steak texture is dry, but surprisingly easy to chew, which tends to melt in your mouth. 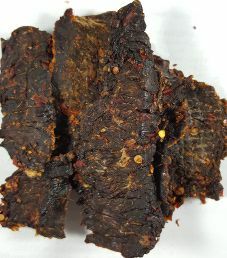 There are no signs of fat, and handling this jerky leaves no oily residue on your fingers. Right away the garlic and chili flavors jump out. Salt and black pepper start to take notice. The spiciness builds as you consume more strips. On a heat scale, the heat level levels off at a 2 out of 4. With only a light level of sweetness, there is good amount of natural beef flavor. In the background is a great ratio of the soy/Worcestershire sauces. Overall, while this flavor delivers on the garlic and chili, it’s the exceptional tender texture of flank steak that sets this flavor apart. A 2 ounce/57 gram bag sells online for $8.50. That works out to $4.25 an ounce, which rates as an expensive price. While not cheap, this is a wonderfully bold tasting flavor with a great level of heat. This small, resealable plastic bag has labels affixed to both the front and back. 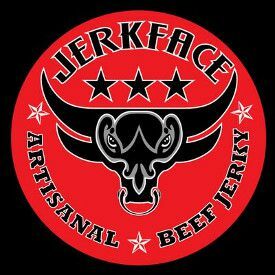 The Jerkface logo is a bull’s head with horns. Their slogan is “Artisanal Beef Jerky”. Some bag categories missing are a soy allergen alert, jerky weight not stated in grams, bar code, USDA inspected logo, and a blurb about this jerky or flavor. The @jerkfacedc Twitter and Instagram handles are provided. An email address is displayed for customer inquiries.